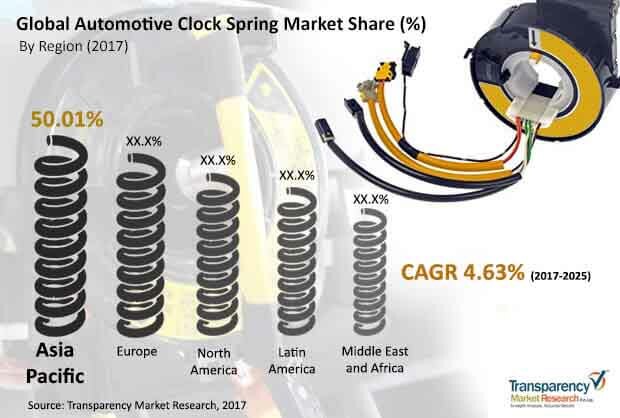 According to TMR, the global automotive clock spring market, which was valued at US$2.5 bn in 2016, is likely to reach US$3.8 bn by the end of 2025, exhibiting a CAGR of 4.63% between 2017 and 2025. Regionally, accounting for more than 49% Asia Pacific emerged dominant in 2016. The region is likely to remain at the helm through the course of the forecast period. Improving economic conditions and the rising demand for passenger vehicles will boost the automotive clock spring market in Asia Pacific. Based on vehicle type, revenue contributed by the passenger vehicle segment to the market surpassed that of the commercial vehicle segment in 2016. However, in the coming years, the global automotive clock spring market is likely to benefit significantly from the rising sales of light commercial vehicles. Various factors are steering growth in the global automotive clock spring market. For instance, stringent regulations implemented by government around the world in light of escalating rate of road accidents will augur well for the global automotive clock spring market. In the coming years, the market will significantly gain from the rising demand for passenger vehicles and light commercial vehicles. Also growth witnessed in the automotive sector will give the global automotive clock spring market significant impetus. In the coming years, high investment in research and development is expected as the market players compete for lion’s share in a global sphere. Innovations in the automotive industry, will in turn fuel the demand for advanced clock springs. This will create an environment conducive to the overall market’s growth. With consumers around the world willing to spend on the latest advancements, the global automotive clock spring market has a steady future ahead. Against this backdrop, the rising disposable income of consumers especially across emerging nations will bolster lucrative prospects for the market. On the downside, rapid changes in car technology may threaten clock spring manufacturers unless they up their game. Recent developments in the field of autonomous vehicle are also likely to pose challenge in the coming years. Nonetheless, with leading players seeking an increased level sophistication in the field, experts predict several technological advancements in the coming years. This is likely to give the global automotive clock spring market significant impetus.